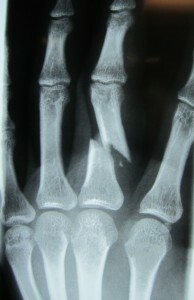 Phalanx fractures are common hand injuries. These fractures are also called “broken fingers,” and they can occur from a variety of injuries such as a fall, a motor vehicle collision, or sports injury. There are fourteen phalanges in each hand — three in each finger and two in the thumb. The phalanges make up the bony architecture of the fingers and they are very important for normal hand function. If you recently injured your finger and are wondering if it is broken, the best thing to do is get an x-ray to find out. You can get x-rays in your physician’s office, urgent care, or local emergency room. Many breaks or fractures in the fingers can be misdiagnosed as “just a sprain” or a “jammed finger.” If a finger fracture is not treated appropriately, the long-term results may not be good. I have heard from many patients “I could still move it, so I didn’t think it was broken.” While in many cases, a fracture causes the finger to be stiff and difficult to move, however, this is not true in all cases. When in doubt, get it checked out. What are the treatment options for a broken finger? The treatment plan will depend on the severity of the fracture as noted on the x-rays and the patient’s medical condition, activity level, and desires. Satisfactory healing of a phalanx fracture is important to restoring overall hand function. Early diagnosis and treatment is very important, and hand therapy can help with range of motion, swelling, and strength during the healing process. Most patients have fractures which are stable and well-aligned. These patients do not need surgery. Treatment in these cases is typically rest and protection of the fracture with a splint for a few weeks. Sometimes “buddy-taping” to the uninjured, neighboring finger can be used in stable fractures. Follow-up x-rays are obtained in clinic to evaluate how the fracture is healing. Some displaced fractures can be re-aligned without surgery, called “closed reduction”, and these patients can also be treated non-operatively. This procedure can be done in the office using numbing medicine (lidocaine) in many cases. Hand therapy is often helpful in improving range of motion and strength after the fracture heals. Some patients have fractures which are more severe and the alignment of the fracture is not satisfactory. Depending on the patient’s health and activity level, surgery may be advised to improve and maintain the alignment. A fracture which heals in poor alignment (“crooked”) can significantly affect the patient’s grip strength and hand function. Fractures which injure the joint surface are more prone to complications such as finger stiffness and arthritis. What is involved with phalanx fracture surgery? The surgery is performed on an outpatient basis using either local or regional anesthesia (nerve block). During the surgery I improve the alignment of the phalanx fracture and use an implant to stabilize the bones. Fluoroscopic x-rays are used in the operating room to confirm the alignment. In many cases I can use temporary pins to hold the bones in place. 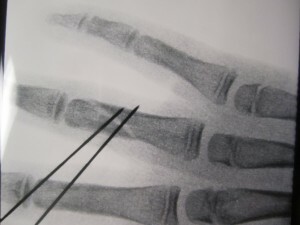 This is a minimally-invasive technique with less scaring and is called “closed reduction and percutaneous pinning”. Sometimes, an incision has to be made in order to re-position the bones, and then I use a small plate and/or screws to fix the bones. This is called “open reduction and internal fixation”. Which technique is used depends on the patient and fracture pattern and is often determined in the operating room. Rest and elevation of the hand to the level of the heart is very import for the first few days after surgery to reduce swelling. The first few days after surgery can be quite painful, and pain medications will be prescribed to help reduce the pain. These medications should be weaned as the pain subsides. Your fingers and hand will be protected in a plaster splint after the surgery. The plaster splint will be removed in clinic after a few days and a removable, custom splint will be made by one of our therapists. At this point, most patients can begin gentle wrist and finger range of motion with the oversight of a hand therapist. Recovery time varies among patients, depending on the severity of the injury, possible complications, and pain tolerance of the patient. Adequate nutrition is important during the healing and recovery process. I recommend a diet rich in protein and calcium and an adequate intake of calories per day while your body is healing. If you smoke, eliminating tobacco use will decrease your risk of nonunion, delayed healing, and infection. The natural tendency of the hand after trauma is to become swollen and “stiff.” Dedication to a home exercise program and/or hand therapist can be valuable in reducing the chance of stiffness and weakness. Occasionally, despite dedicated work with therapy, some people do not regain full motion or strength after this injury. Finger stiffness is more common if the fracture occurs near or within the joints. How can I prevent a future fracture? Some phalanx fractures are related to reduced bone density or osteoporosis. Most people with osteoporosis can decrease their fracture risk with lifestyle changes, calcium and vitamin D supplements, and medication. A bone density study can be ordered by your primary care physician to evaluate for osteoporosis and help predict future fracture risk.